Get free advice and estimates from paving contractors in your city. According to Realtor.com, real estate professionals “agree that a home’s first impression can make a huge difference in how well it fares on the market.” A significant element in that curb appeal is the driveway because it is one of the first noticeable features of the home. 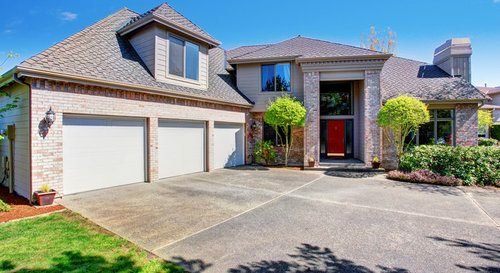 This article will help you decide between the two most common driveway surfaces, asphalt 1 and concrete. Both asphalt 1 and concrete have the basic ingredients of stone and sand in their composition. The difference is in the adhesive element that binds these ingredients together. For asphalt, this adhesive is tar, a byproduct of gasoline, kerosene, and diesel production, whereas the adhesive for concrete is cement. Also called blacktop, asphalt tends to be dark, although some stains and specialized finishes are available. Asphalt driveways are, therefore, color limited. Concrete, on the other hand, tends to be light in color and offers more flexibility in design than asphalt driveways. A wider choice of stain colors and specialized finishes are available. 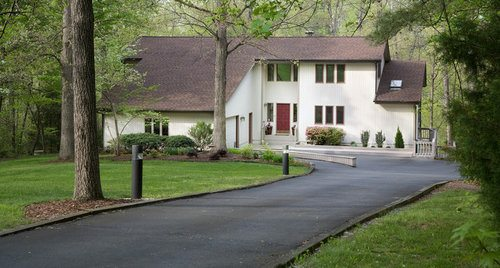 In terms of aesthetics, a homeowner may choose to match the roadway in front of their home, such as choosing asphalt to extend an asphalt road or concrete for a concrete road. Local government ordinances and homeowner association covenants should be consulted before making a final decision. Professional installation is required for both asphalt and concrete driveways due to the labor and specialized equipment required. Also, both types need a strong foundation of gravel before the surface material is spread. The method of applying asphalt, rolling and compressing, limits personalization. Recent advancements, however, allow limited color manipulation. Also, the edges of an asphalt driveway tend to be less straight and neat than a concrete one. Concrete is easier to customize to attain different colors, styles, and textures. Stain or tint will change the color of the entire driveway or patterned areas. Other techniques such as stamping, etching, or brushing, can personalize the texture and finish. The typical residential concrete driveway takes from one to three days to complete, not including curing time. An asphalt driveway will take about the same length of time to prepare and lay. The curing time, however, is less, as described below. Both asphalt and concrete must cure for a time before they can be used. The difference is the amount of time needed for curing. Because asphalt sets and hardens more quickly, it cures in a few days and can be driven on in three to five days. Due to the high moisture content in new concrete, a freshly poured driveway must cure for seven days before it can withstand the weight of a vehicle. An asphalt driveway is considerably less expensive than a concrete one. As a matter of fact, installing a concrete driveway will cost the homeowner at least 45 percent more. The average asphalt driveway will cost from $2 to $6 per square foot. For example, laying a 600-square-foot driveway will cost approximately $283 in materials. Labor will add about $947 for a total of $1,230, an overall cost of $2.05 per square foot. If a stamped or colored top coat is desired, the cost can rise to $8 per square foot or higher. Installing a concrete driveway, on the other hand, will cost $4 to $10 per square foot. Building a 600-square-foot driveway will cost approximately $868 in materials and about $2,126 in labor for a total of $2,994, an overall cost of $4.99 per square foot. Adding a stain or custom finish can drive the price to $15 or more per square foot. An asphalt driveway is better suited to a colder climate because intense, persistent heat conditions can soften the surface. This can lead to cracks and crumbling along the edges. It can also allow asphalt residue to stick to shoes. In the winter cold, however, ice is easier to remove from asphalt than from concrete. Concrete, by contrast, performs better in hotter climates. Intense cold can cause frost heave, which is the upward swelling of the soil in freezing conditions and can result in driveway cracking and other damage. Also, de-icing salt can damage the concrete finish. Maintaining an asphalt driveway is labor intensive. The driveway must be sealed about six to twelve months after installation. Then, it must be resealed every three to five years after that. This is because asphalt is petroleum based, and the oils it contains will oxidize over time, costing the surface its moisture content. This changes the color and makes the surface brittle. Sealers are not required for concrete driveways, but they are recommended every few years to prevent stains and maintain custom finishes. When stains do occur, a degreaser will be needed to remove them. Cracks are easier to repair in asphalt driveways with less visible results than concrete, and inexpensive resurfacing is possible. For concrete driveways, however, weathering makes any repair quite obvious, and resurfacing is not possible. With proper maintenance, an asphalt driveway can last about 30 years. Without maintenance, the driveway can be unsightly and perhaps unusable after only five years. Even with a good maintenance record, the durability of asphalt cannot match that of concrete. A concrete driveway, which can last 50 years or more, needs little maintenance or additional expense. 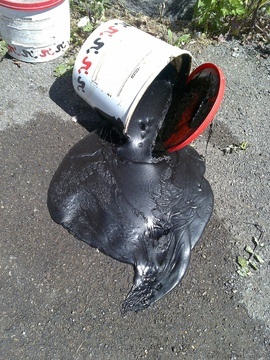 Oily stains are more difficult to see on the dark surface of an asphalt driveway. However, they tend to remain on the surface if the asphalt is properly sealed. This makes it more likely that these stains will be tracked into the home. Because a concrete surface is lighter and more porous, stains will be more visible. However, they will also soak into the concrete more readily and probably will not transfer to your shoes. How much does it cost to seal an asphalt or a concrete driveway in my city? Cost to seal an asphalt or a concrete driveway varies greatly by region (and even by zip code). To get free estimates from local contractors, please indicate yours.